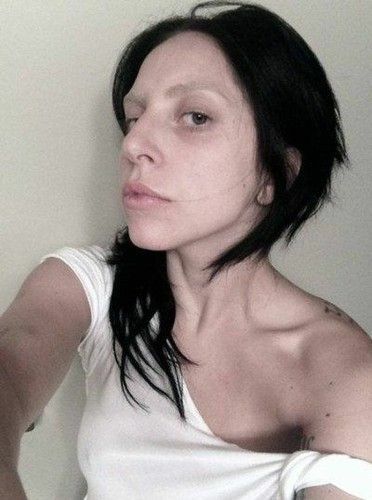 10 Photos of Celebrities Without Makeup! They’re all perfect looking Venuses and Adonises and just generally completely ethereal in their beauty and completely beyond the realm of human understanding, right? No. Wrong. They’re people. It’s just that the media makes them out to be so perfect, and the only time we ever see them is in full makeup, dressed up, and that becomes what’s expected of them. So heaven forbid that they should ever not be in makeup. You know, like loads of people around the world. Because then they’d be ugly! So, gathered from around the internet, here are a few pictures of celebrities without makeup on, with the attached message: THEY ARE PEOPLE. STOP BUYING INTO THE RIDICULOUS EXPECTATIONS OF WOMEN. Tyra Banks shows off the real her, behind all the makeup, in this picture. Go her. Lady Gaga. Granted, she’s a bit weird, but she’s still, you know, a person.